Memorial Day Weekend will be one to remember this year – assuming all parties remain healthy, of course. Shortly after confirming middleweight champion Chris Weidman would defend his throne against Vitro Belfort at UFC 173, company president Dana White reported archenemies Chael Sonnen (pictured) and Wanderlei Silva would also collide in the May 24 event. Sonnen and Silva are currently serving as opposing coaches on “The Ultimate Fighter: Brazil.” The two have engaged in a vicious verbal warfare for years, and tensions came to a head last week on set when they came to blows. This time, they will get paid to fight in a sanctioned bout. 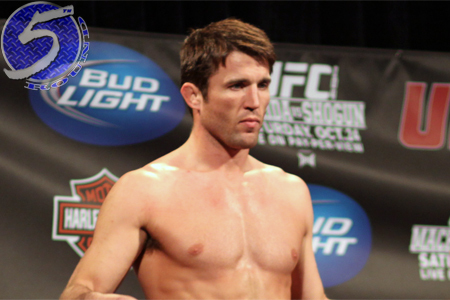 Sonnen will be looking to bounce back from a lopsided loss to Rashad Evans at UFC 167. The chatty wrestler has dropped three of his last four fights. Silva, meanwhile, hasn’t been seen since beating Brian Stann in March 2013. “The Axe Murderer” has alternated between wins and losses over his past six scraps.